Canadian housing data continued to disappoint in the month of June. Albeit the year-over-year decline in home sales was not nearly as disappointing as the month of May. National home sales fell 11% year-over-year in June, a slight upgrade from the 16% decline suffered in May. As sales dipped, so too did the total amount spent on real estate. The total dollar volume dipped 12% year-over-year in June, totalling $23.5B CDN. A tough blow to government tax coffers which have reaped record sums of property tax dollars in recent years. 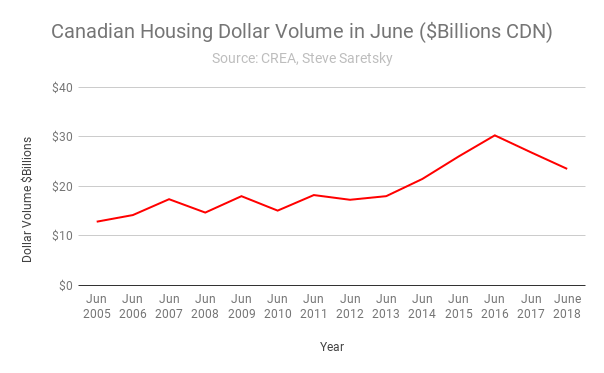 Dollars spent on Canadian Housing in June. The national slowdown was particularly unkind to the province of BC where home sales slid 33% year over year, the largest drawdown since June of 2008. Weak buying activity hit Greater Vancouver & Victoria the hardest, sales fell 38% and 30% respectively. However, the pullback was not exclusive to the province of BC. 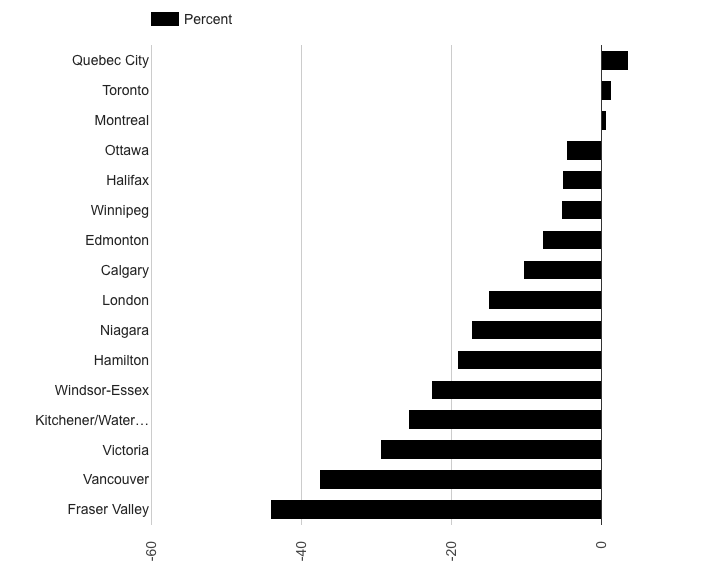 Other than small year over year gains in Quebec City, Toronto, and Montreal, most major cities were hit with a drop in home sales. The average sales price across the nation dipped in June for the first time since June of 2012, shedding 1% year over year. While this marked the fifth month in a row in which the national average price was down on a year-over-year basis, it was the smallest decline among them. 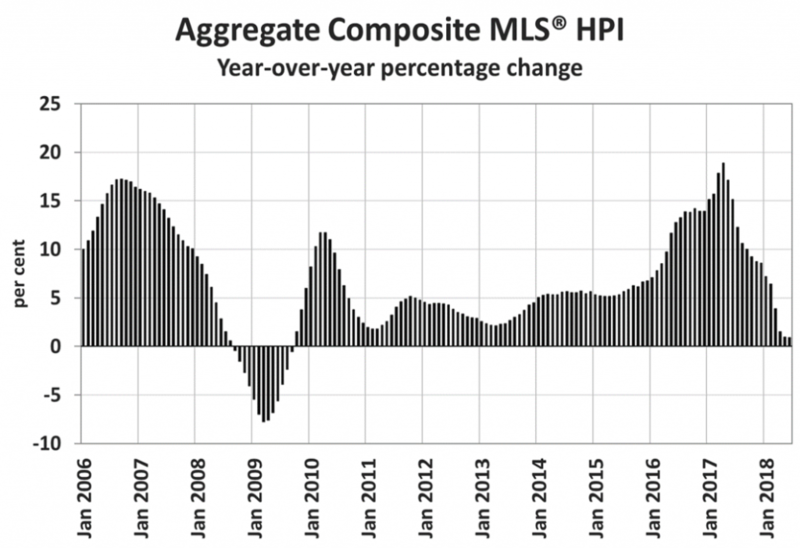 The Aggregate Composite MLS® HPI was up 0.9% y-o-y in June 2018, marking the 14th consecutive month of decelerating gains. It was also the smallest increase since September 2009. MLS benchmark price change year over year. With another rate increase from the Bank of Canada in July, and housing inventory still building, up 3%, CREA’s enthusiasm may be a little premature..